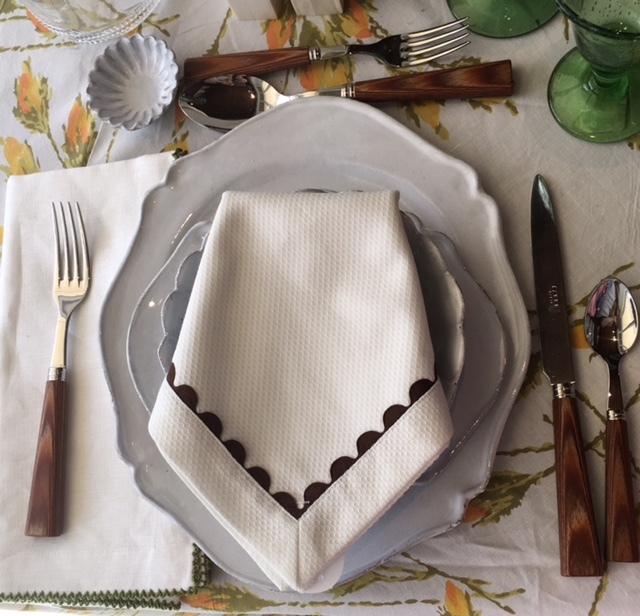 Some of our very favorite (and best selling) items are napkins and place mats made by an American design house, Julian Mejia. 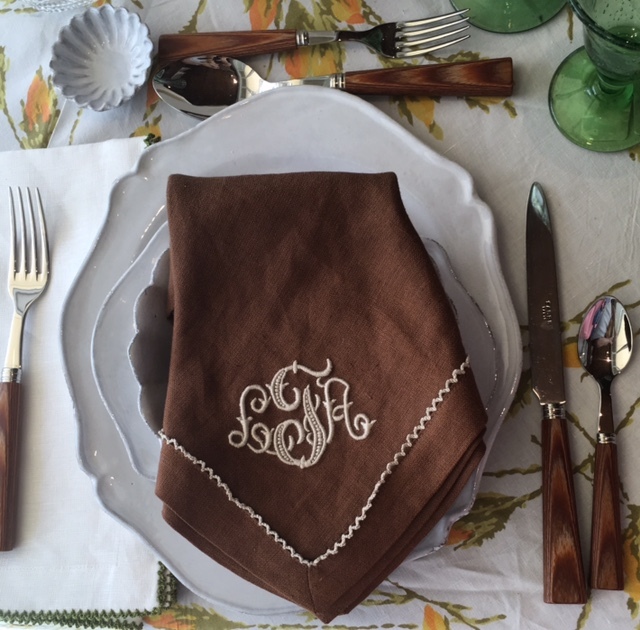 These are our go-to napkins for monograms. 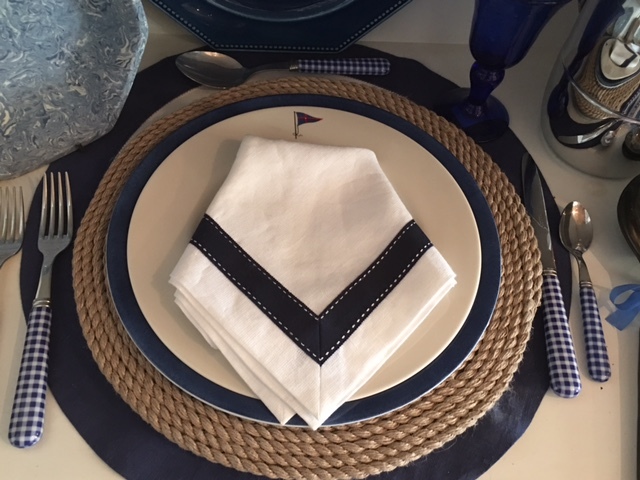 You can order them with a plain edge, with picot trim on the edge or with picot trim on the body of the napkin, which is called an American Hemstitch. 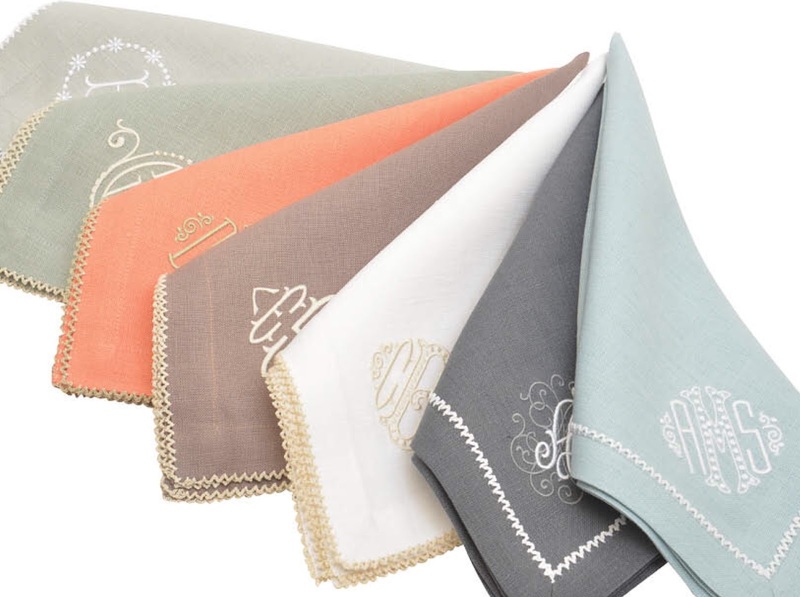 The added weight and softness of the particular linen he uses gives these napkins a formal feel while making them extremely easy to care for. Julian offers a traditional 22" dinner napkin, but will make the napkins any size you wish. You can order oversized napkins, square or rectangular cocktail napkins or little folded tea napkins. It's totally up to you ! 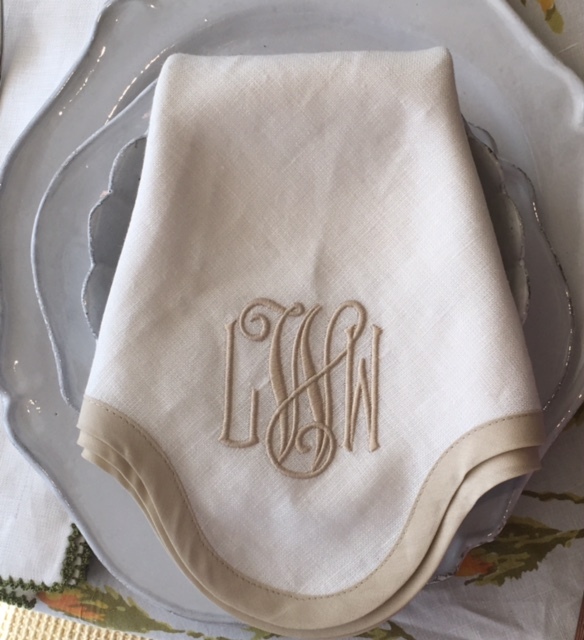 You can even choose to make a cloth (with or without edging) in a custom size to fit your table. 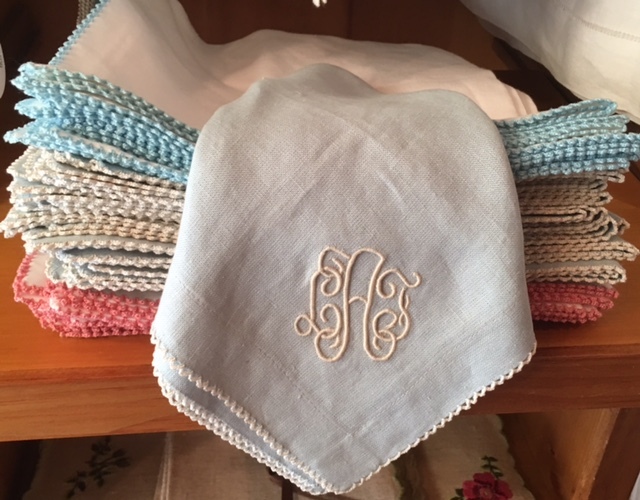 We always have all white napkins on hand at the Boutique, and a smattering of other color combos as well. 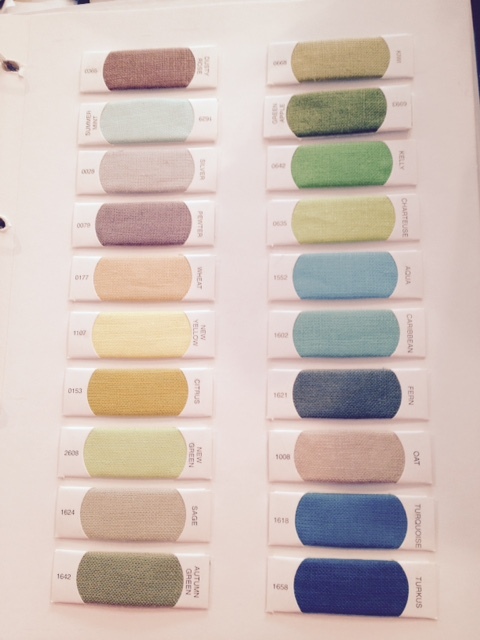 These colors vary by the year. It just depends on our mood when we place our order. Because there are so many colors of linen and colors of picot edging to choose from, you can virtually create a totally custom combination to match your china, your dining room wallpaper or your Easter dress. We've done it all ! 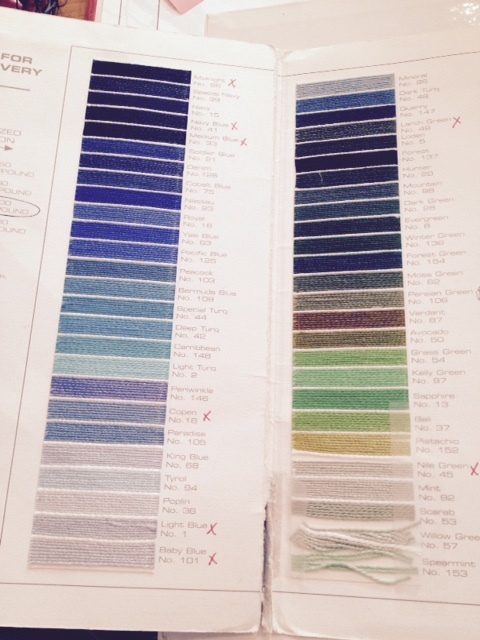 Here, above, is just one of three pages of the picot trim you can choose from. Picot is a cotton yarn that is crocheted by machine into a edging that is about 1/8" wide. 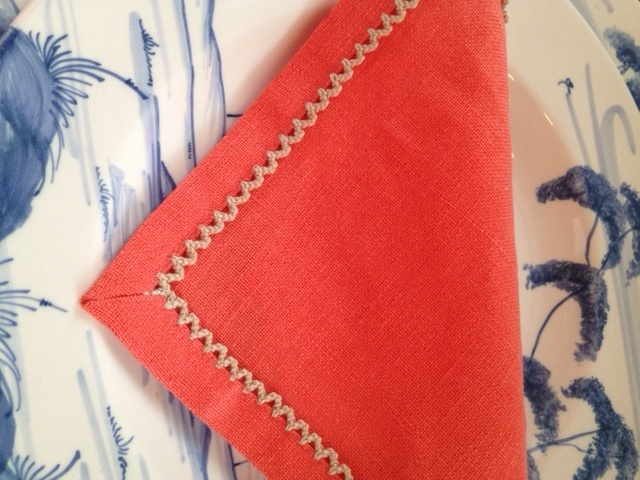 It is then applied to the edge of a linen napkin in such a way that it creates a scalloped look. 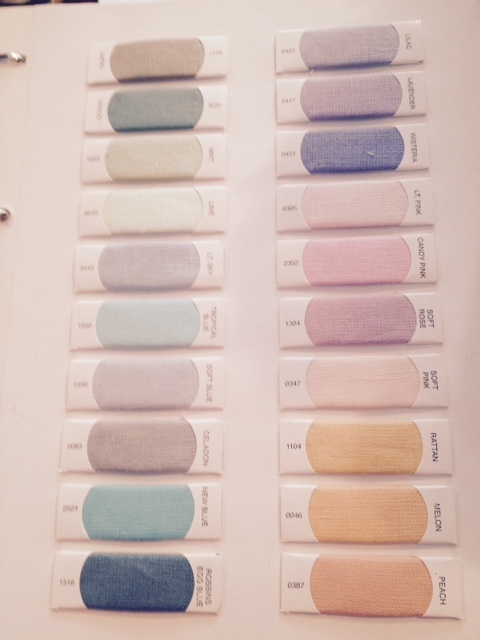 And below are three (of seven total) pages of linen color choices. 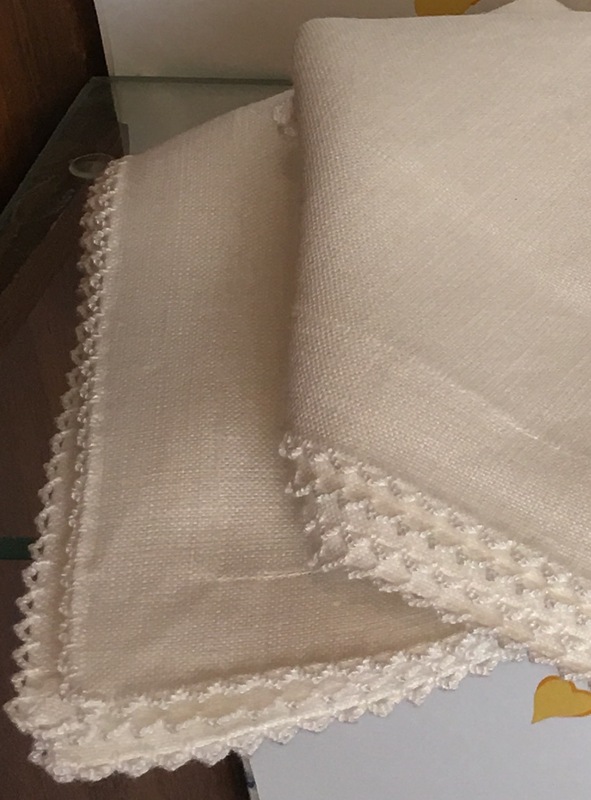 This Nevada-weight linen is a heavy, garment weight linen that drapes well, wrinkles less and absorbs more (spilled wine or au jus) than your traditional linen used by most napkins companies. For every day use, it can be hand-pressed right out of the washing machine and left to dry on top of your dryer. If you are using your napkins for a "fancy" dinner, you'll want to iron them for a nice, crisp finish. 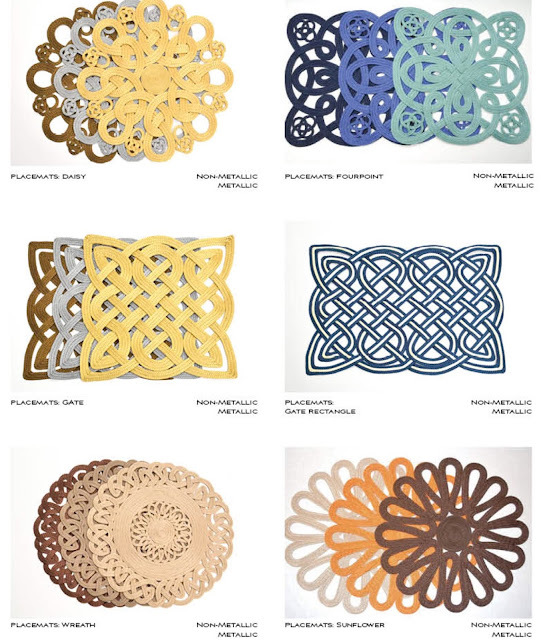 Although the picot edge is the most ordered style, Julian has been introducing several others that we think you will love as much. Also made from Nevada-weight linen is the contrast hem, scalloped-edge style. 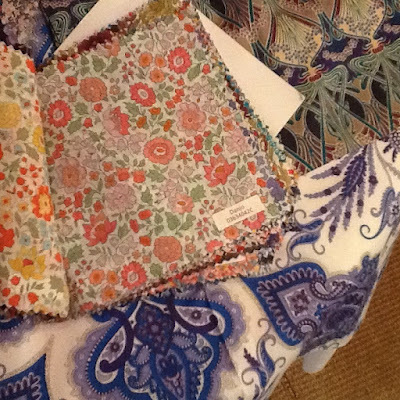 Shown in a two-linen combination, it is also available with a contrast hem of Liberty of London fabric (there are a multitude of prints to choose from). 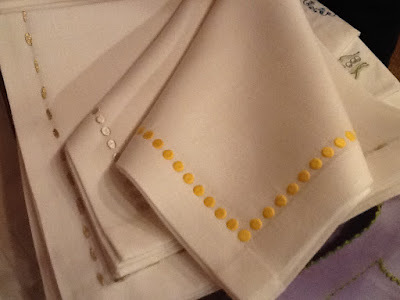 In addition to the linen we are so enamored of, Julian offers a white cotton piqué fabric as the main fabric of the napkin. To this piqué you can add a picot edge, a ric rac edge or as an interior ric rac trim as shown below. The piqué can also be used for the scalloped-edge style with a contrast hem of Liberty fabric. 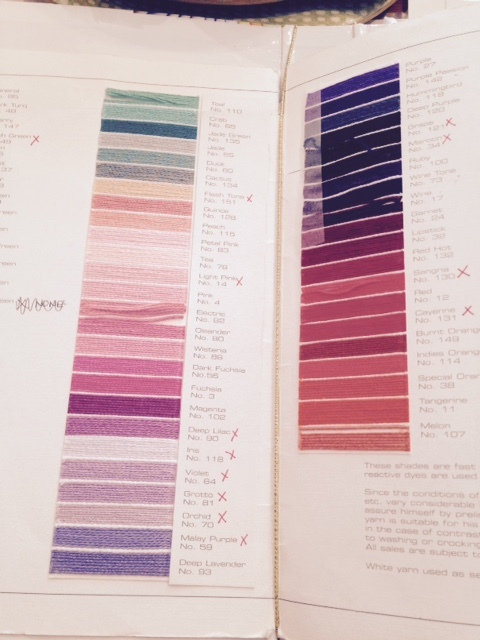 Julian uses grosgrain ribbon to trim some of his other selections, and you know how much I adore ribbon trims. There is a wide grosgrain ribbon with a contrast stitch or a skinny grosgrain, either of which can be applied to a linen napkin for a clean, modern look. A straight edge, contrast hem linen napkin can be daring and bright as those shown below or subdued simply by using white for the body of the napkin and ecru or soft grey as the contrast trim. 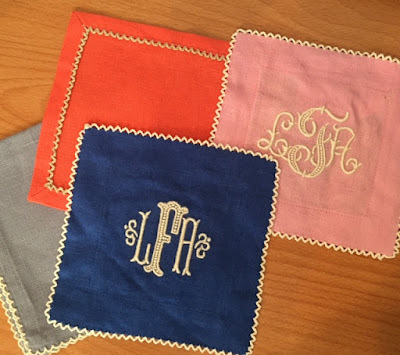 Embroidered dots, ovals or lines add just a pinch of color for the tradtionalist who prefers his or her napkins to remain mostly white. 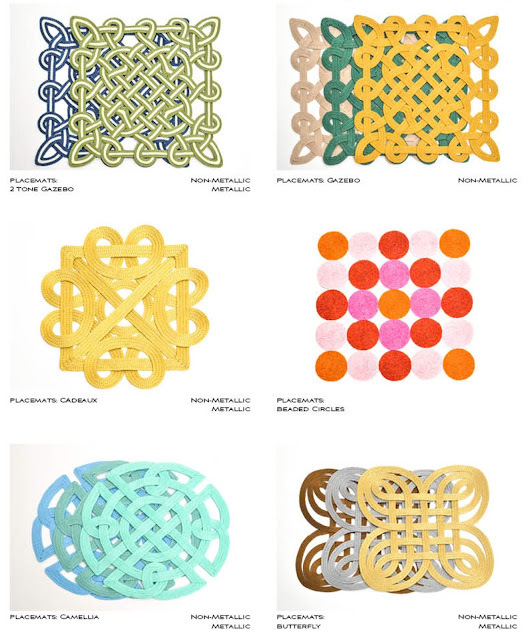 Several years ago, Julian introduced these interesting woven placemats. You can order any style in any of his woven colors and can, in fact, choose two colors when ordering the styles with a double-color weave. 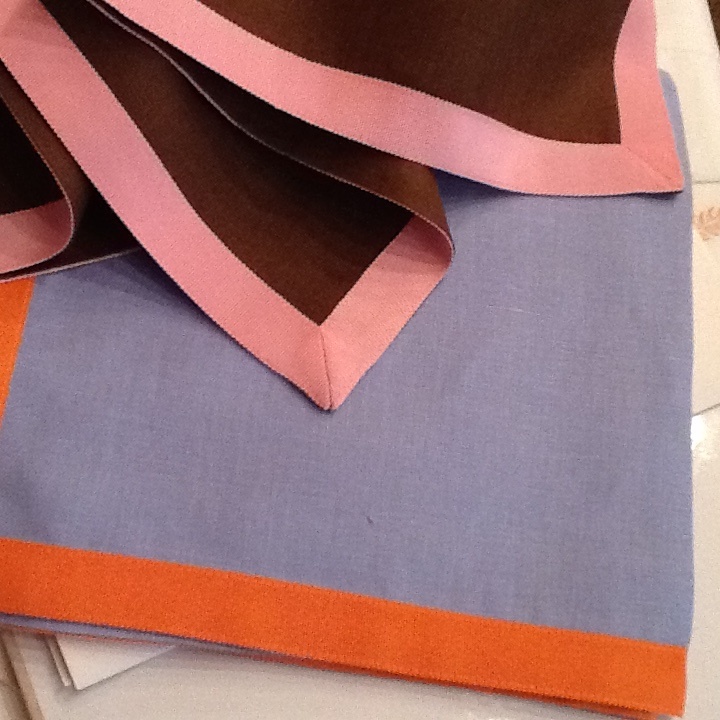 We are very fond of the double-color styles and will have stock in our shop by September. 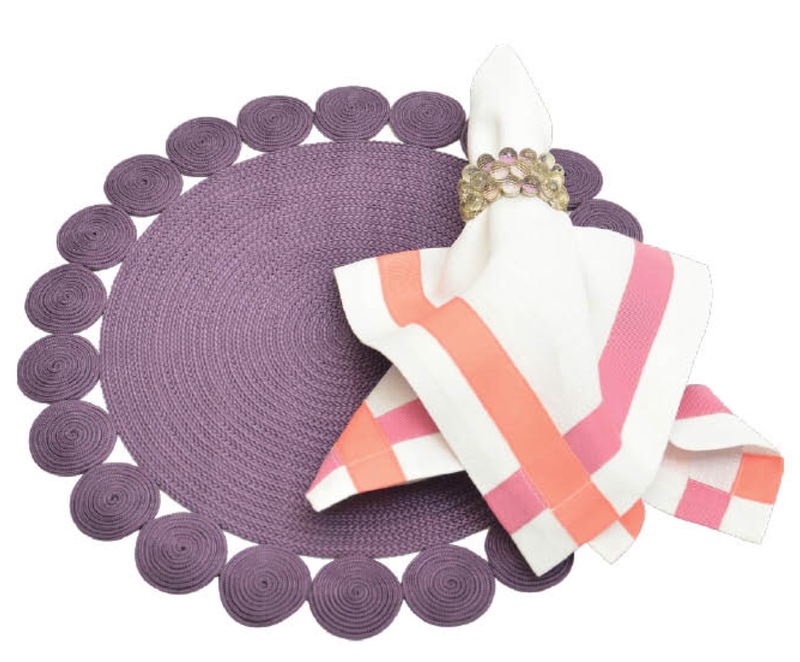 Julian Mejia's tabletop collection will inspire you to create color combinations for your mats and napkins that coordinate with every dish in your cupboard. 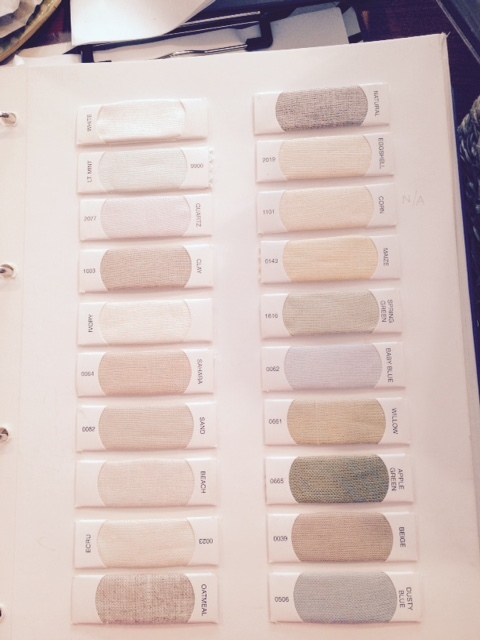 It's hard to stop once you place your first order and see the quality and easy care of his products. 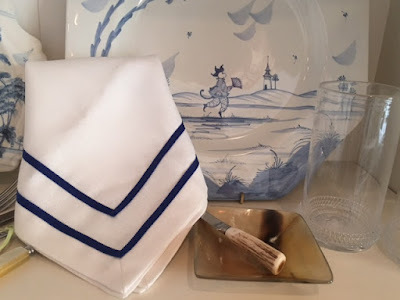 In fact, every napkin you have ever bought will sit undisturbed in your linen cabinet as your new "Julian's" will be decorating every placesetting, casual and formal for years to come.